Anyone who has traded with Goldman Sachs most likely knows it is always an adversarial relationship. Banks that trade do so for themselves and employees are compensated according to the profits made on the desk. That is the nature of the business. However, Goldman Sachs is primarily a trader. That is where the profits have come from not the rudimentary workings of banking. So to some extent those who complain about employee compensation should invest in some other business where talent is not rewarded. That said, there is a substantial difference between making a normal spread and carrying a book that is the traded against client’s interests or with intimate knowledge of their positions. Banks that are aggressive traders should be flat outright illegal. The reason for this is rather simple. If an investor goes belly up, they are not coddled by the Federal Reserve. Where are the regulators even defending the clients at MF Global? As typical, the Securities & Exchange Commission has kept with its true colors – bought and paid for. The SEC has defended Goldman Sachs against a coalition of religious groups over compensation. Of course Goldman is finding hard to keep pretending they are doing God’s Work sucking up all the excess cash from society to reduce its decadence. The bank has been in the spotlight since Greg Smith, published his scathing op-ed piece in the New York Times describing Goldman as a “toxic and destructive” culture motivated by greed, which should be no surprise. Nonetheless, for the past two years, a group of religious institutions that hold Goldman shares has asked the investment bank to review their executive compensation packages, which has in the past at least been taken up at regular shareholders’ meetings when the economy was falling apart. This time, the religious group again sought to have its proposal voted on by shareholders. However, for the first time, the SEC has sided with Goldman, which argued it had already complied with the request previously. The SEC thus rejected the religious group, including the Sisters of St. Francis of Philadelphia, and is supporting the real God’s Work done by Goldman. The SEC’s letter of rejection was emailed to the religious groups’ leaders the day AFTER Greg Smith, published his scornful op-ed piece in the New York Times. What the SEC fails to understand is that the United States is being view as corrupt and the source of economic instability emerging out of New York that has been infecting the global economy. The old image of the carpetbaggers from the North is starting to emerge again. Back then, banks would call a mortgage at any time. They afforded no time to even refinance. It was due and owing right then. In Alabama, the right of redemption period is now one year. 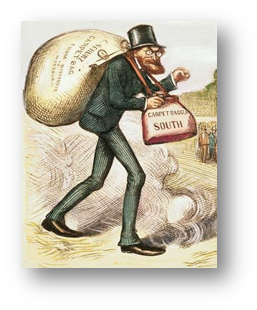 Post-Civil War, loans were given for rebuilding the South. But the banks were allowed to call a these demand loans at any time they wanted with a 30 day notice. It didn’t matter whether the borrower was behind on their mortgage or not. This presented a problem, as it could be difficult to find new financing if the bank that lent to money needed it back. This led to carpetbaggers swooping in and buying foreclosed properties on called loans that were worth significantly more than the amount that the bank called. All this happened because the owner didn’t have enough time to refinance. Alabama and other states were forced to make laws to allow a person to redeem their property if the bank foreclosed. Eventually, a federal law was passed which then stopped banks from being able to demand mortgage loans be returned unless the borrower was in default. Today, the same shady practices are seen emerging from New York and this time the regulators protect the banks from no real regulation to even allowing the clients of MF Global to suffer the loss of their funds being stolen against the law that they will not enforce. Just as there had to be regulation against the carpetbaggers, this time we need to clean house among the regulators. Until that takes place, Congress will risk the continued loss of financial power to overseas. Eventually, this will be the seeds of destruction for as capital flees the USA and public assets, the decline in confidence in US banking will diminish the ability to perpetually roll the national debt and that is when the Sovereign Debt Crisis will materialize for all to see.